What Should you know about Technical Specifications of Projectors? 1 What Should you know about Technical Specifications of Projectors? Are you a movie addict? Why not take your movie watching to a new level. Watching your favorite movies at home is not a problem anymore. You can find the best projectors that suitable for your home theatre and This will be the best choice you will ever make by checking this Best 4k projector in 2019. With us, you can find information about the important features to create your home into the best cinema setup. Before buying Projectors, you have to know about how the projectors work and how to use it. But here we brought you about What should you know about Technical Specifications of Projectors such as Color and White Brightness, Contrast Ratio, Aspect Ration and Keystone Correction. Our guide would help you to decide which projector that you should have in your home cinema. A lumen is a unit of luminous flux in the International System of Units. It is equal to the amount of light given by a solid through a certain angle by a source of one-candela intensity radiating in all directions. Firstly, projectors have the different brightness which depends on the intended purpose by the user. The brightness differs because of different lumen illumination. Projectors have the different amount of lumens. A projector with 1000 lumens can handle different image sizes ranging from medium-sized to a small size image. The ideal place to use this type of projector is a faintly lit room. The next type of projector has 2000 lumens. This type of projector is perfect to be used in a room with moderate lighting. The range can handle any size of the screen. Moreover, there is still a 3000 lumens projector which turns out to be the most expensive but it is very bright. To add on that, this projector should be placed in a room with some lightning. Another interesting feature to take a look at is the different aspect ratios which these projectors offer. The 16:9 ratio which is also called the wide aspect is one of the most popular aspect ratios. It is incorporated in the latest WXGA and WXUGA notebooks and has largely surpassed the 4:3 since it is largely used. Additionally, there is the 4:3 or NTSC aspect ratio. This aspect ratio matches the traditionally less definition television set or computers which lie in the SVGA, XGA, and UXGA category in terms of resolution. The dimension of the 4:3 is similar to the field of view in the human eyes. Furthermore, 2.35:1 also known as the widescreen Cinemascope format is also an interesting aspect ratio. This is the established medium for “Big Screen Cinema” or theatre format that may vary 2.35 to 2.40 or even wider. Another aspect ratio incorporated in projectors is the 16:9 format which is also the HDTV was developed by SMPTE. The HDTV was determined to accommodate high definition performance with the most optimal results in visual perception. 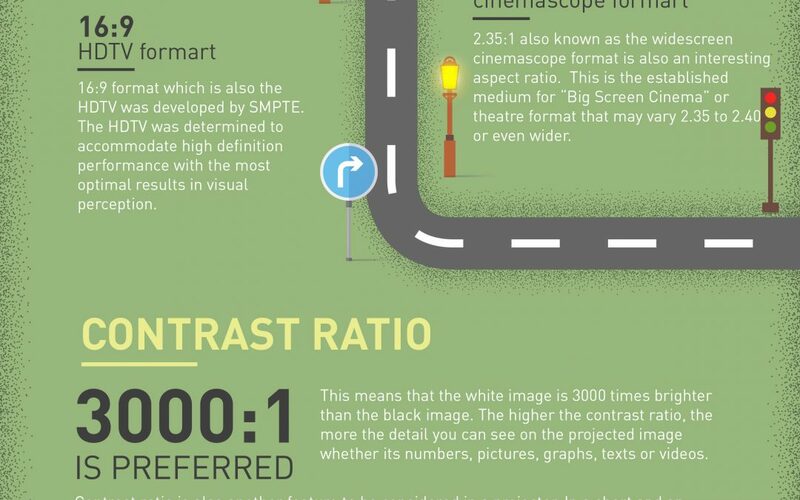 The contrast ratio is also another feature to be considered in a projector. In a short and an understandable term, the contrast ratio is the ratio of light reflected from an all-white image and an all-black image. The most common and preferable contrast ratio in projectors is the 3000:1. This means that the white image is 3000 times brighter than the black image. The higher the contrast ratio, the more the detail you can see on the projected image whether its numbers, pictures, graphs, texts or videos. In addition to that, there are four major things which determine the contrast provided by a projector. The first factor that determines contrast is the windows in any room. If the windows happen to be uncovered it is advisable to cover the windows to get the perfect contrast. Additionally, lights in a room also affect contrast. To get that desired contrast and effect from a projector the lights need to be off and this is pretty obvious. The third factor is the coloring of the walls and the floor in a specific room where the projector is always used. The darker the color the better the contrast. Most of all, the type of screen where the projection happens determines the contrast. A projection screen happens to be better than a wall. Projection alignment in terms of angles by which the images hit a wall/screen should be done pretty well. This brings about the solutions to ‘key stoning’ whereby a projector is aligned non-perpendicularly to a screen. The two different types of key stoning are the vertical and horizontal keystone correction which are incorporated in projectors.